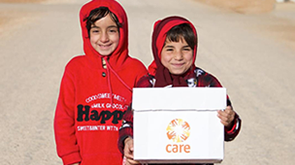 CARE knows how to find new and effective ways to fight poverty. Here are just some of CARE’s innovations that are making a big difference to millions of people’s lives. CARE’s pioneering Village Savings and Loan Associations have helped 5 million people - 70% of them women - to make plans for a better future. How can poor and marginalised people actually have a say over what sort of health or education services they need? How can you provide food aid in a remote and extremely poor community in a way that also boosts local markets? CARE found an ingenious solution to the problem of women in Ecuador having to walk down the mountain to get water from the river. Bangladesh is prone to flooding and livestock like chickens often drown in floods – so why not rear some floating food instead? Our Shouhardo project with 2 million of Bangladesh’s poorest people proved that women’s empowerment is the best way to improve everyone's lives.